You need to make this while you can still get fresh cherries. I found the original recipe here, which recommends using brandy. I did a little research and found that cognac or brandy could be used, though it seems that cognac is most popular. You will have to do a bit of work for infusing the cognac and making the syrup, but I don’t think you’ll be disappointed. A cherry pitter would be helpful, but not necessary. 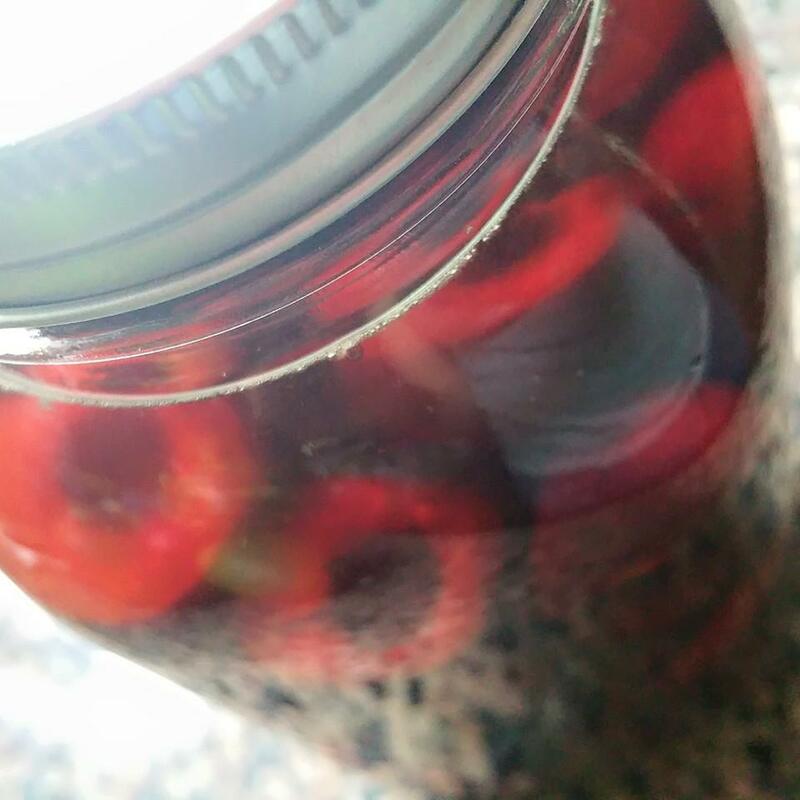 Combine the prepared cherries and cognac in a container. Add a couple tablespoons of pits as well. Cover and keep in a cool place for at least 5 days. EDITED 6/16 TO ADD: A quart canning jar works perfectly this for this…fits everything very nicely. Combine the cherries, sugar and water in a medium saucepan. Bring the mixture to a boil. Simmer for about 20 minutes. Add the mixture to a blender and blend until smooth. Pour the syrup through a strainer and remove the solids. Put into a container and store in the refrigerator. Once your syrup is made and cognac is ready, it is time to make your cocktail! If desired, rub a wedge of lime around the edge of a glass and dip in sugar. 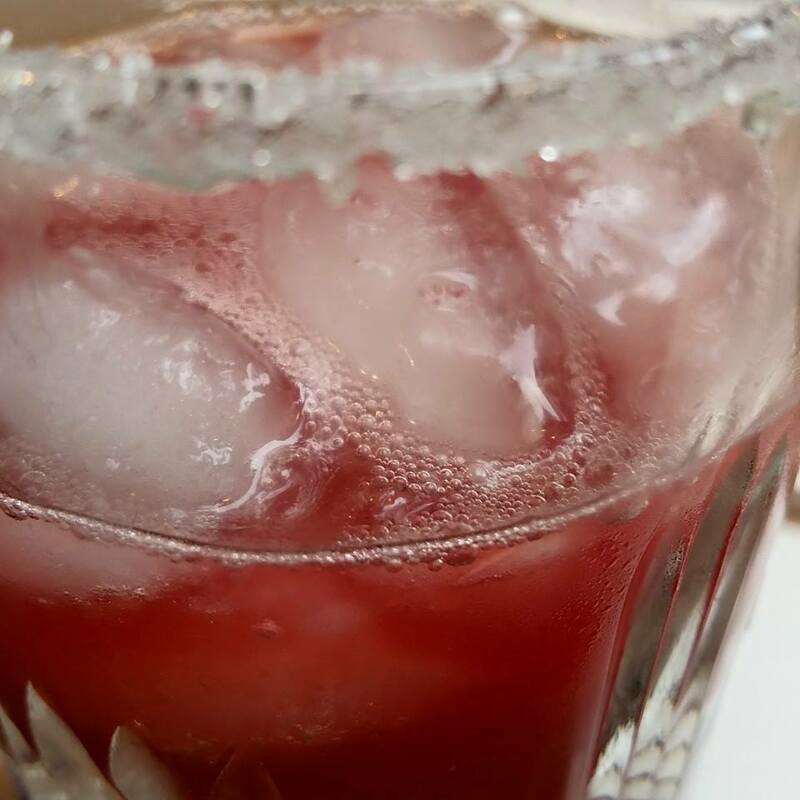 Next, add lime juice, cherry cognac, and cherry syrup into a cocktail shaker with ice. Shake well and pour into the prepared glass. I found this mellow, but naturally sweet and fruity. It was very easy to have more than one. You may find that the ingredients are so precious that you may not want to share. Either way, fresh cherries are only in season for a limited amount of time, so I recommend trying this one as soon as possible! Wow! This sounds amazing! Am reblogging! Cheers! Reblogged this on Meg Sorick: writes better than she dresses.